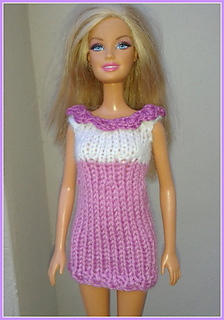 This is the first knitted dress pattern I made for Barbie, although it has been updated a few times. I couldn't resist adding a crochet collar as they were very popular at the time. The collar is made using 4ply cotton yarn and because a bit closer fit around the neckline I included a back opening for an easy fit. Double knitting yarns can vary in thickness which can make a big difference to sizing in a small garment such as these knitted dresses. Budget yarns tend to be thicker than better quality yarns and although would not give such a close fit, will work well. I used King Cole Comfort double knitting. If you want a looser fit use a no 9 needle throughout (after checking your tension) The key is to keep fitting the dress against the doll as you knit, and as they are so quick to knit, can easily be redone. 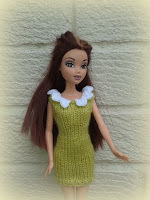 When finishing the dress I sew a few securing stitches at each side of the armholes as sharp Barbie fingers can easily snag knitted garments. Both dresses can easily be made in the round, noting that the round begins at centre back. You will need to change to rows for the back opening if making the dress with collar. (10 clusters) break off yarn, leaving a tail for sewing. Sew centre back seam to back opening, using mattress stitch. Sl st bottom of gs edge in place. sew on small button to correspond with buttonhole.